Sturdy hardbacks with page after page of beloved characters and engaging narratives: Anne of Green Gables; Agatha Christie collections; a Hans Christian Anderson compilation. When I open these old friends, I always bring them close to my face, hoping to capture the faintest hint of new-book smell that I imagine lingers deep within the binding, a fragrance unique to each book that evokes memories of the person who gave it to me and the countless readings when I was younger. No less treasured are the paperbacks. I have a small, fat volume containing all of Jane Austen’s published novels. An inexpensive, tattered Chronicles of Narnia has a new home on my daughter’s shelf. And every few years I reread a unnassuming copy of Jane Eyre. These favorites have their own associations that elevate them above the realm of great literature. One was a gift from my husband who knew of my affection for the author; another we read aloud together when we were dating; and one marks the transition I made from enjoying a good read to more deeply appreciating the craft of character development. Some of these books take me back to the couch in my parent’s living room where a fire burned in an unlovely black stove and everyone had a favorite seat and a favorite read. Others remind me of the life-altering moments when I discovered the beautiful language and characters within their pages. Like the Sunday I first drew The Lion, the Witch and the Wardrobe from the shelves of our church library and stepped into Narnia. Or when I huddled in the dark of our family’s suburban during the late Christmas-night drive home from my grandparent’s house and read Anne of Green Gables for the first time by the thin illumination of my father’s key chain flashlight. There is no childhood possession that can rival the fine words of my favorite books. No toy can stand against compelling images or beautifully drawn characters. These precious books stimulate more than sensory memory. They engage my mind, fire my imagination and inspire creative responses. I always have three to four good reads stacked on my bedside table, a symbol of the glass-is-half-full part of my nature. 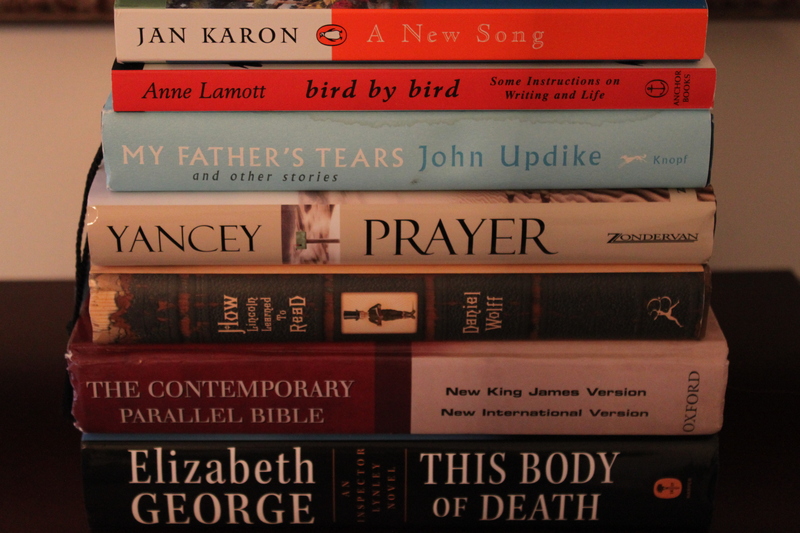 It’s unlikely that I will read even one of those books in the time I’ve allotted (usually one week.) To imagine that I could finish all of them is pretty far out there. In this world, words are supreme. Images are created, characters unveiled and plots unwound, without sound or illustration. Words, crafted, invoke emotions and memory, and persuade me to momentarily disregard what I know to be true and accept the premise of the world they create. The Complete Short Stories of Mark Twain, Charles Neider, ed.